One night about ten years ago me and my best friend decided to stop by a local “hangout” of ours in Bowie, MD to smoke a cigarette before he dropped me off at home. We grew up here and spent our early years wandering the railroad tracks and woods, smoking and drinking as children do. So this one spot is a railroad overpass at 450 and 197. There’s a parking lot and a small area of grass and trees, about 30 foot strip of land separating the tracks and the lot. So it’s nighttime and we decide to go there to smoke a cigarette. We go on the tracks and we’re facing the parking lot, so the overpass and to our left and the tracks go on to our right. This way we’re still barely in the glow from the yellow parking lot lights. Now we’re smoking and he’s talking but the entire time I’m focused to my right, peering down this track because I have the strangest feeling. I didn’t know what it was until later and it was the feeling of being watched by a predator, which I’ve never experienced before. After about two mins we’re almost done our cigarettes a helicopter flies right above us, seemingly at tree level, with the spotlight briefly going right over us coming from the direction of the overpass. Not 5 seconds later I hear the gravel shift from between the tracks and I look towards the overpass. Standing right in the center of the overpass, there is this GIANT silhouette. Now since it is dark and it’s under the overpass I can only see it’s silhouette. It’s about 8 or 9 feet tall and burly looking. It appeared as if its head was attached to its torso, completely bypassing any semblance of a neck, the way super-jacked dudes look. It was huge and we only looked at it for about a second before I said Let’s go now! Now we we hurriedly starting rushing away and we hear the gravel move closer and not 3 seconds later we both hear the most demonic, horrifying, multiple pitched screech literally right behind our heads. It came from no more than a FOOT BEHIND US. So of course we book it to his car and no we didn’t look back because are you f**king kidding me get real. We get to his car and funny thing his lanyard got stuck around the steering wheel and when we pulled out his keys pulled out of the ignition as he turned the steering wheel. Anyways we drive around for an hour, only thing we could say is “what the f**k” and that’s my encounter with the Goat Man. Now a week later we’re hanging out with our friend...let’s call him Andy. Now Andy has spent a lot of time in the woods and he was telling us about how last week the cops were out in the woods because they heard screams and thought a woman was being raped. Now I asked him if they had helicopters out and he said yes, and I asked him what day it was and it was the same night we saw the Goat Man. So we told him our experience and he was like yeah that was him. 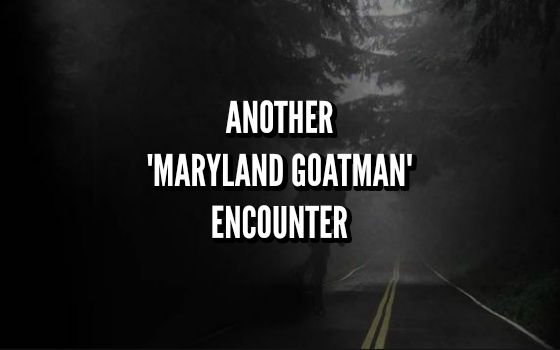 This goatman guy sounds like the devil. Legs of a goat and horns on his head? If that isn't the devil I don't know what is! !